Kiké Hernandez hit 3 homers to lead the Dodgers in an 11-1 onslaught of the Cubs. 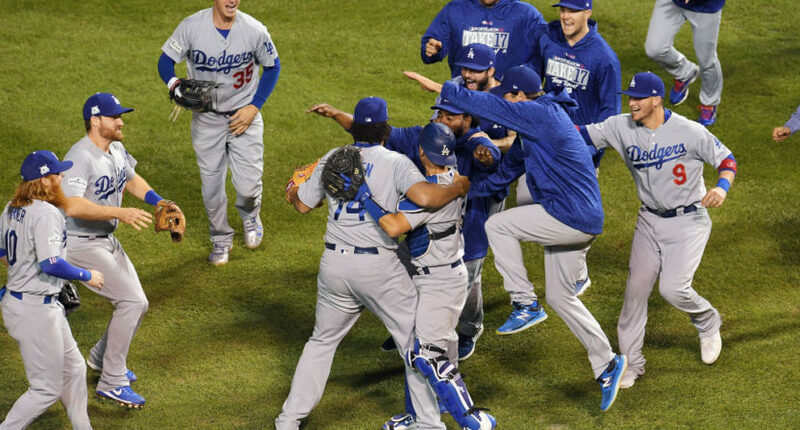 For the first time since 1988, the Los Angeles Dodgers will play in the World Series. The Dodgers continued their stellar run through the postseason with an 11-1 win over the Cubs on Thursday night at Wrigley Field to clinch a spot in the Fall Classic. The story of Game Five was Kiké Hernandez, who hit three home runs and tied an LCS record with seven RBI. His first home run came with the bases empty in the second against Chicago starter José Quintana. The Dodgers struck for a run in the first inning, so the solo blast made it 2-0. The Dodgers put the game out of reach in the third inning, thanks largely to Hernandez. Justin Turner got the scoring started with an RBI single before the Dodgers loaded the bases and knocked Quintana out of the game. After Héctor Rondón struck out Logan Forsythe, the Cubs had a chance to get out of the inning without any further damage done. But Hernandez had other ideas, smashing a grand slam the other way to put the Dodgers on top 7-0. Hernandez completed the hat trick in the ninth inning, hitting a two-run shot off of Mike Montgomery to put the finishing touches on an 11-1 win for Los Angeles. He became the first Dodger and the tenth player ever to hit three home runs in a playoff game. It’s fitting that a platoon player like Hernandez was the star Thursday. For a team with the league’s highest payroll, the Dodgers are full of reclamation projects and unsung heroes. The team is 7-1 in the playoffs because someone different has stepped up every night. Chris Taylor and Justin Turner shared NLCS MVP honors, something that would make no sense to even the most ardent baseball fans three years ago. That’s not to say that the stars didn’t shine. Clayton Kershaw allowed just a solo home run to Kris Bryant in six solid innings to earn the win. Kenley Jansen and Co. tossed three scoreless innings in relief. Dodger relievers threw 17 shutout frames in the series. It might have seemed like fait accompli with the way the Dodgers were playing, having dominated in the playoffs and winning a league-best 104 games in the regular season. But these Dodgers had an uphill battle to get here. Prior to 2017, the team had made it to the postseason 10-straight times without a pennant. Los Angeles had to get revenge on a Chicago team that cruised by them last year en route to history of their own. They proved that they’re capable of postseason success, having outscored the Cubs 28-8 in five games. The Dodgers will have home field advantage in the World Series regardless of their opponent, with the first two games next Tuesday and Wednesday in Los Angeles. Kershaw is slated to start the opener, and the Dodgers expect Corey Seager to be back in the lineup. Things are lined up for the Dodgers to party like it’s 1988.